In these records they found the name of Claude Joseph Patrick Nunney. 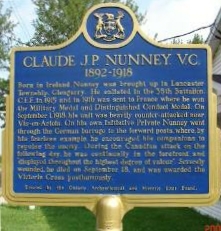 A monument to the memory of Claude Nunney is located at the ‘four corners’ in North Lancaster, Ontario. Lancaster Branch, along with the efforts of the late Comrade John MacLaren, were instrumental in ensuring that this memorial be erected. He was posthumously awarded the Victoria Cross. In 1955, a lot was purchased behind what is now ‘Glen Cairn Lodge’, as well as a granary building from Glen Gordon, which was moved onto the lot. In 1961, the Legion was left a $5,000.00 bequest from Comrade Robert McDougall. As no provision had been made in Mr. McDougall’s will concerning his house and property, the Legion arranged to return the money in lieu of the building. They then purchased the lot behind this building for $500.00. The building was at 6 Oak Street. The original three Charter members (Ivan Clark, Len MacLachlan and Maurice Lagroix) have all passed. In 1998 the Branch moved to its current location, 119 Military Rd., Lancaster. There is a replica of the Victoria Cross Medal in the Hat Badge cabinet on the North wall of our hall. This history of Branch 544 was compiled in a small booklet, created by Associate Member, Janice Montreuil, on September 30, 1992. It was commissioned by President Betsy Robinson and Vice-President Dr. Donal F. Conway, in honour of the “Voyageur ’92-Canada 125 Project”. The information was taken from news clippings of the time, and is presented in good faith as being accurate. 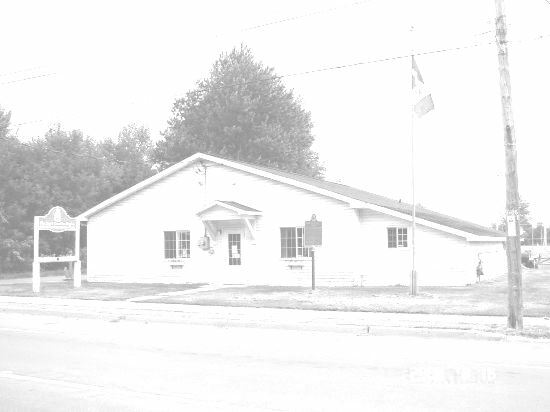 The history of our Branch of the Royal Canadian legion begins in 1951 when a group of dedicated veterans began meeting in the Lancaster library. They met there for two years. They were endeavouring to find a suitable location in Lancaster Village in order to build a permanent building which would become the Legion. At the same time, they were searching through official records of World War I. They wanted to name our Legion after a veteran from the area in order to have an active and productive Branch.